Hey there Viber fan! Viber gives its app the ultimate Facelift update it needs. A smoother UI, faster sending of messages and a whole lot more. Viber, the leading messaging app, rolls out a new chat screen design that gives its one billion registered users a beautiful and remarkably efficient chatting experience, with messages sent and delivered at twice the speed and receive status updates! The upgraded design is now available for all iPhone users and will be rolled out soon to Android users. Faster messages than ever before. You can now exchange messages twice as fast as before, so your chats will flow more naturally and move along more quickly and eliminate the panic of an unanswered text. Quicker message status icons. You can now quickly see whether your recipient has read your message with these new message delivery status icons: ✓ means your message is sent; ✓✓ means your message has been delivered to your recipient’s phone; while ✓✓ means your recipient has seen your message. Bigger & brighter chat bubbles. 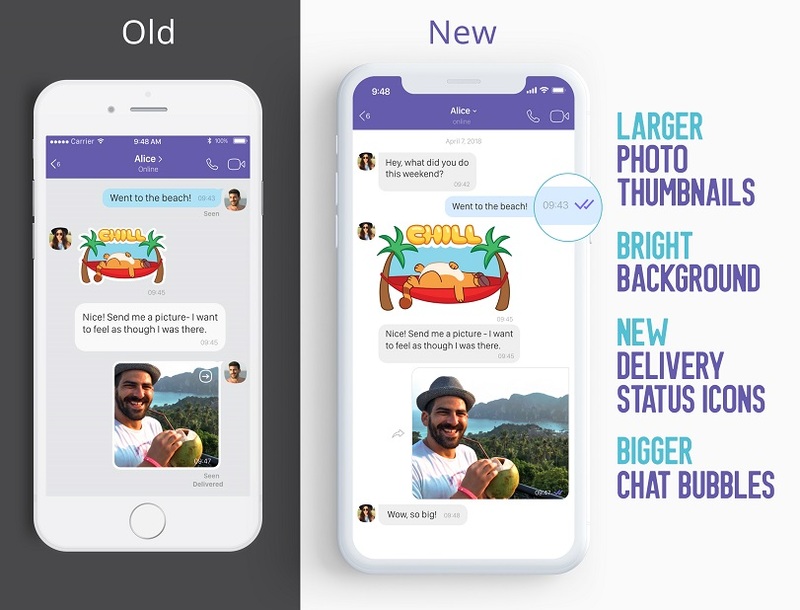 Viber’s new brighter chat color scheme and bigger chat bubbles show more content in the screen making it easy for you to see and focus more on the chat’s content at one glance. A sharper GIF, photo and video experience. Now, you can receive bigger photos or videos from your family and friends in bigger, better quality thumbnails in your chat screen. Of course, Viber is equipped with end-to-end encryption by default, making it the safest messenger out there. Users know that by using Viber their data and content isn’t shared with third parties, while even Viber itself can’t access it—giving them 100% privacy. Providing an exceptional communication experience to the hundreds of millions of people using Viber passionately every day is what drives us for constant innovation. We wanted to give our users a fresh stunning look, that not only looked good but really runs better from the inside out... Everything we do revolves around how we communicate with each other and how we ultimately connect. Now, no matter where our users are located around the world, they will have the fastest service available all without compromising a fun, quirky and visually stunning chat experience. Experience the new, fresh chat screen with faster messages when you update to the latest version of Viber today!